This was the post where I declared that Abbott would never be truly popular because he’s so a. AWKWARD and b. Deluded, like Ken Sherry from one of my favourite films, Love Serenade. Yeah, it’s all started. Again and again and again. Election campaigns are always fun as theatre. The political theatre we see in Australian election campaign is a bit like a Williamson play – full of empty speeches, pompous white men and taking itself much too seriously. In it are people who are a little bit like some of the best Australian film characters – daggy, a little awkward and a little bit slow. Even the political characters from the few political films we do – like in The Honourable Wally Norman (never heard of it? Don’t worry, you’re not alone) and the Dad and Dave political film (the original Rudd story), are daggy. Fair dinkums, sauce bottles and “what the ordinary Aussie wants…” everywhere. But there’s awkward like Kevin Rudd trying to emulate the Australian idiom in a Kochie kind of way and then there’s a.w.k.w.a.r.d. Tony Abbott strikes me as an incredibly awkward uni student who grew up to be an incredibly awkward man trying to be an everyday bloke. Trying, but not working. This week I spoke to a Sydney Uni student of the 1970s who was aware of “this bloke on campus who was DLP. Imagine that!” For that is one of the more stark facts about Abbott’s life was that he was, in the 1970s, still trumpeting the causes and visions of B.A. Santamaria while others at uni were moving on with their political beliefs. Hence his tenacious grip on a paid parental leave scheme that is more DLP and LNP. Now we are seeing the second campaign of Abbott and that awkward way of expressing himself, laughing and talking to regular people is becoming more obvious. Today we had this image from Alex Ellingshausen, which I think is the sort of awkward image we will see a lot as the campaign continues. I think even the Liberal Party have realised that Abbott looks incredibly awkward around people, so their first campaign ad – called (A) New Hope features a whole group of (almost entirely white) people in stills. Even the stills of Abbott – one of him in the high vis vest and the “I can look like Don Draper” aeroplane shot at the end – look awkward. 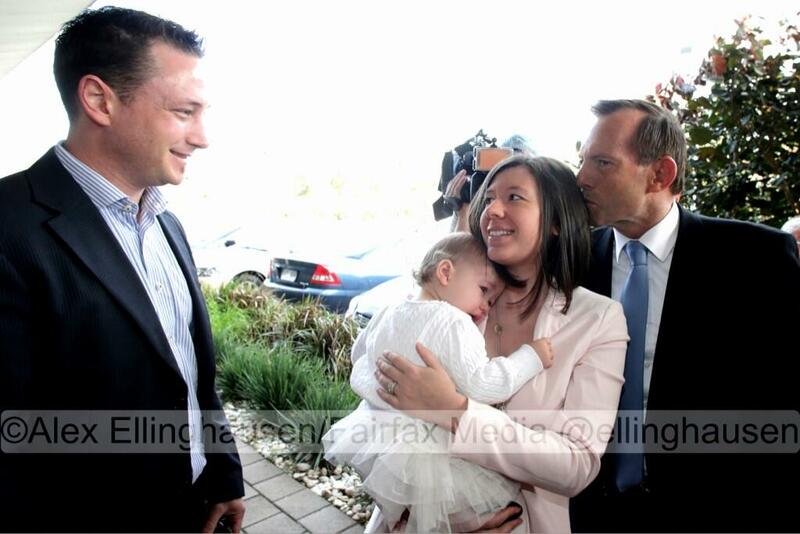 This is not to say that we should either be picking on Abbott for that awkwardness, nor making him look endearing due to it. 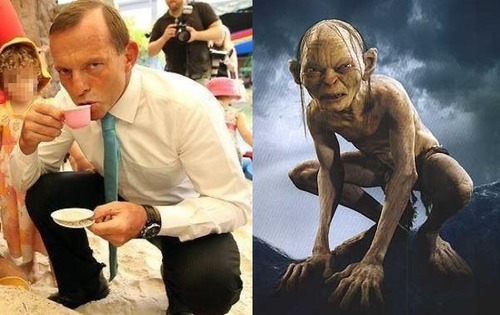 It does make me think, however, as this election will drag on, voters will continue to find it hard to warm to Abbott as the leader when he tries to be the blokey alpha matey male figure instead of the fiery Catholic values holding outsider he was in the 70s. In that, I think Abbott is suffering what I’m calling the Ken Sherry Effect. Never heard of Ken Sherry? Never heard of the Palme D’Or winning film of 1996, Love Serenade? Ken Sherry was a major character (well, there were really only 4 characters) in the film. I love the film because it’s a tribute to awkwardness. Sherry has the self image throughout the film of being a major babe magnet with a deep voice, open necked shirts intoning cliches or long dissertations about love and life. This image is fed by the adoration of Dimity – the most awkward character in Australian film – and Vicki Anne, who still reminds me of every second woman interviewed about politics in voxpops done by our various media outlets. To Dimity and especially Vicki Anne, Ken Sherry is the paragon of manhood and someone to be admired. For the rest of us, we see Ken Sherry as an incredibly awkward, poignant character – though one that has realised, deep down, that he is also odd, like the rest of the “town” of Sunray. Abbott may have supported and pumped up by the Vicki Annes of Australia, but for the rest of us, he’s a dorky bloke who intones nonsense that makes us roll our eyes. He probably also realises that he’s decidedly odd at times, though he’d never admit it. This is why, when I see Tony Abbott, I see Ken Sherry. I’m not sure that’s entirely healthy for the next few weeks.